A flexible space with almost limitless set-up possibilities! The venue includes an indoor and outdoor area, fully equipped kitchen and bathroom amenities. The cyclorama wall makes a perfect backdrop to capture amazing photos as well as doubling as a disco floor when using the laser lighting and disco ball. 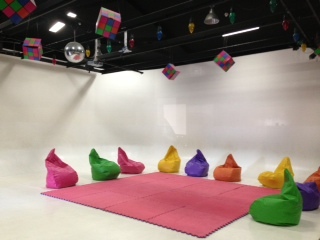 You may wish to hire Action Studios for a private event, activities or a community group. There is a fenced garden with BBQ facilities. Action Studios is a non-smoking, no ball activities venue. Please contact Adele adele@actionkids.com for more information and pricing.